Welcome to another edition of The Friday Five! For those of you who are checking out The Friday Five for the first time, this is a feature that I post every Friday in which I give my thoughts on a topic that’s related to basketball video games, the real NBA or another area of interest to our community, either as a list of five items or in the form of a Top 5 countdown. Last week, I listed my Top 5 Favourite NBA Finals Series, limiting myself to just two of the Bulls’ six championships and saving the other four for my honourable mentions. Having covered my five favourites, this week I’ll be counting down my Top 5 Least Favourite NBA Finals Series. These are the NBA Finals series that I felt were lacklustre, anti-climactic or for one reason or another, just not as enjoyable as I would have liked. Yes, last year’s Finals series makes my list. 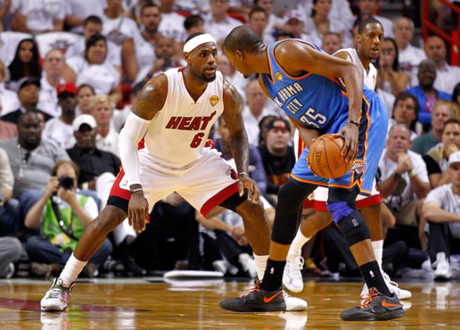 The games themselves weren’t bad, but as I generally cheer against the Heat these days, I wanted the Thunder to win. Also, while the Heat ultimately won the championship because they are a great team and LeBron James stepped up in a way that he certainly did not against the Dallas Mavericks in 2011, I feel that Kevin Durant was robbed at the end of Game 2 and believe that was a huge momentum changer for the series. On top of everything else, my enthusiasm for the Playoffs waned somewhat after Derrick Rose went down with his knee injury in Game 1 of the Chicago Bulls’ first round series with the Philadelphia 76ers, followed of course by Joakim Noah also getting injured and the top seeded Bulls ultimately being eliminated in six games. I did continue to watch the Playoffs and I enjoyed both Conference Finals series, but I definitely wasn’t as into the postseason as I normally am. Again, if I’m to be completely objective then I can’t say the 2012 Finals was a bad series, but it’s definitely not a favourite of mine. 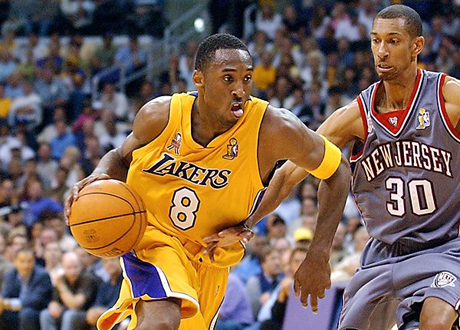 Even though there was only one blowout in the series, the 2002 Finals were fairly one-sided. People talk about the Eastern Conference being weak these days, but it’s still a far sight better than it was early last decade, when it couldn’t even offer one viable contender to challenge anyone coming out of the West. So, despite the best efforts of Jason Kidd and company, the first of two consecutive Finals appearances for the New Jersey Nets ended in a sweep at the hands of the threepeating Los Angeles Lakers. On top of the fact that the Nets didn’t provide a particularly exciting matchup for a superior, star-studded Lakers team, the other cloud hanging over the series was the 2002 Western Conference Finals between the Lakers and the Sacramento Kings. First of all, it was a far more exciting series that many considered to be the true championship series, with the actual NBA Finals being more or less a formality. Second, it remains one of the most controversial series in NBA history with a lot of fans feeling that the Kings were cheated. All in all, it wasn’t a great end to the NBA on NBC, garnering the network’s lowest ever ratings for an NBA Finals series. At this point, Lakers fans are probably thinking that I’m picking on their favourite team, so let me just say that the Lakers have been a part of some of the greatest Finals series in NBA history, particularly their many clashes with the Celtics. Also, while I wanted Boston to win in 2010, I’d still deem it a really good series and it’s probably somewhere in my top 20. However, I have to include their 2009 series with the Orlando Magic on this list, because the best thing I can say about it is at least it wasn’t a sweep. Unfortunately, it’s what happens when an injury depleted team upsets two more heavily favoured clubs before finding themselves overmatched in the Finals. To be fair, only two games were decided by double digits, but I do believe that the Lakers still would have won even if Jameer Nelson had been completely healthy and it wasn’t the series that I was hoping for. I’d have much rather seen the Cavaliers advance so that we could’ve had Kobe vs. LeBron. This series cops a fair amount of flak, but almost always for the wrong reasons. A lot of people didn’t like the 2005 Finals because they claimed that the San Antonio Spurs and Detroit Pistons were boring. The common rebuttal to that point of view is that anyone who expresses it has no knowledge of, nor appreciation for good basketball. I’m more inclined to agree with the latter opinion, so my dislike of the series has nothing to do with a belief that those teams were boring. However, the first four games of the series were boring, as the home team won each contest by margins of 15, 21, 17 and 31 points. With such a lack of competitiveness, the 2-2 series tie was far less exciting than it normally would be. Now, the overtime in Game 5 and closer scores in Games 6 and 7 saved the series from being a complete snooze-fest, but it still stands as one of the least exciting and competitive seven game series we’ve seen, at least in the NBA Finals. The 2005 Spurs and Pistons may be too often maligned for their style of play, but in my opinion the blowouts in the first four games definitely made for one very underwhelming clash for the championship. 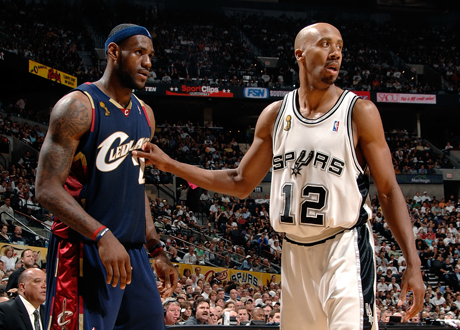 However, nothing compares to the 2007 NBA Finals between the Spurs and the Cavaliers. Not only is this one of my least favourite series, I’ll absolutely nominate it as one of the worst Finals series in league history. On paper there was some promise of an interesting matchup, as it featured a perennial contender being challenged by a team on the rise, led by an emerging superstar in LeBron James. In reality, it didn’t work out so well. The series was a sweep, not exactly a hallmark of a classic postseason clash. LeBron, spectacular in leading the Cavaliers over the top seeded Pistons in the Eastern Conference Finals, was good but not great against the Spurs, averaging just 22 points and shooting below 40% from the field. 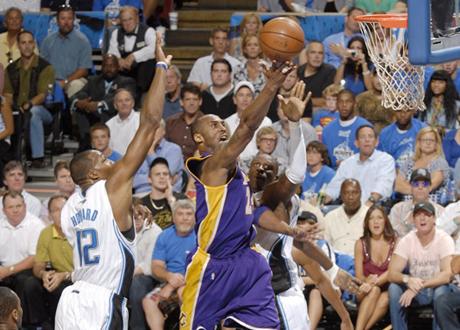 The two teams topped 90 points only once in the series and that happened in a game decided by 11 points. It’s easily my least favourite Finals series and it’s no surprise that it remains the lowest rated NBA Finals to date. If I can pick on the Spurs one last time, their 2003 series against the New Jersey Nets – the second lowest rated Finals to date – probably at least deserves an honourable mention. It barely escapes my countdown as it was competitive enough to go for six games, saw David Robinson retire in style and Tim Duncan almost had a quadruple double in the deciding contest. The fact that two former ABA clubs were meeting in the NBA Finals for the first time was also kind of an interesting footnote. Hopefully the 2013 NBA Finals won’t end up cracking this list but in any event, what are some of your least favourite NBA Finals series? Have your say in the comments below and as always, feel free to take the discussion to the NLSC Forum. Thanks for checking out my Top 5 Favourite and Top 5 Least Favourite NBA Finals Series, please join me again next week for another edition of The Friday Five! As I started watching the NBA around 1992 with my first Final series being the 1993 Finals, I have to agree on the list in general, but not on it’s order as I’m willing to rank the Spurs vs. Pistons series over the Spurs vs. Cavs series. Well that’s just a matter of personal taste. The only thing I did like about the 2012 Finals was the superstar match up between Durant and James, other than that it was meh.